LOS ANGELES – The Los Angeles County Board of Supervisors voted Tuesday to take steps to limit the number of roosters residents can keep, aiming to stop illegal cockfighting. Supervisor Kathryn Barger pointed to the seizure of nearly 7,000 birds in a May 15 raid in an unincorporated community in the Santa Clarita Valley. 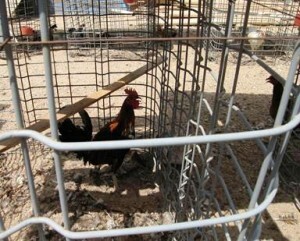 The Santa Clarita Valley raid was the largest seizure of illegal cockfighting birds in U.S. history, according to the county Department of Animal Care and Control. All of those birds had to be euthanized because of the aggressive nature of roosters bred for fighting and also because of concerns about the spread of disease. Thousands of chickens statewide had to be euthanized in 2003 when fighting chickens brought from Mexico into the U.S. were found to have Exotic Newcastle Disease. Neighbors are typically alerted by noise and odor when large numbers of birds are housed nearby. But paraphernalia for fights is often kept separate from the birds, making it hard for deputies to make arrests and shut down illegal operations. A number of California counties have fought back by adopting ordinances restricting the keeping of roosters, and Barger and Kuehl said the changes have been effective. “Los Angeles County should have the same protections for its residents,” according to their motion. Read the motion here. County lawyers and animal control personnel were directed to come up with a recommendation to limit the number of birds and report back in 30 days. Any ordinance would apply only to unincorporated areas of Los Angeles County, including Quartz Hill, Littlerock and Lake Los Angeles. Officials are urging anyone observing animal abuse or neglect to call animal care and control officials at 562-940-6898 and to report any cockfight in action to 911. 7 comments for "L.A. County takes steps to stop illegal cockfighting"
15805 newmont street in lake Los Angeles. They are so proud of their fighting birds that they are displayed for all to see as they drive by their backyard. Animal control and the police department do absolutely nil for these animals. Besides their birds, they have starving horses and calves in their backyard. Dogs come and go there also. Sad. Karma…. are you on facebook by chance?? how can i contact you??? Defined as that tasty bird you put into soup. O.K., it is all 50 states now. Still, those so called God-fearing people that pay taxes are very influential. It is a billion dollar blood sport. Well this is what you get when you allow illegals to pour in and welcome them with open arms. Also Americans will be murdered by illegals like that women in SF. This is what you get when you vote liberals in. We should expect more of these problems. Ron, there are men and women with powerful friends in Washington that run cockfighting. God-fearing citizens that pay taxes. It is illegal in California, and most other states. I believe there are three states that allow legal cockfighting. When you have big money involved, it becomes secretive.